Julia Jewelry, franchise outlets that provide a wide variety of white gold jewelry, give promo 10 percent discount all items, except the chain and the item labeled best buy. Besides Julia Jewelry is also still present a year-end promo 20 percent discount for certain items. "Julia was introduced promo 20 percent discount, which was launched late last year, discount carpet was held at the end of last year and was extended until the end of this month" says Janet, Julia Jewelry Jewelry Advisor Top 100 Penuin. Circuit Julia Jewelry jewelry collection have become more varied. Items such as wedding rings, bracelets, chains, earrings and various other jewelry is presented with the latest designs and models. White gold levels in Julia Jewelry has the best quality, ie 750 white gold. "This is the highest level for this type of white gold" said Janet. 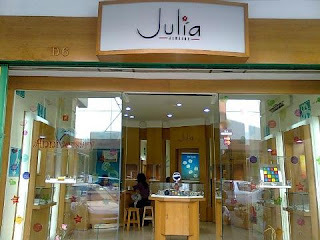 For after-sales service, Julia Jewelry warranty and service forever "warranty service is valid forever and throughout Indonesia" said Janet adds. Until now, Julia jewelry has 36 branches throughout Indonesia, in Batam Julia jewelry has 2 outlets are in the Top 100 Penuin and at Nagoya Hill. And by February this jewelry she plans to launch a new program that was prepared for the moment valentine ..